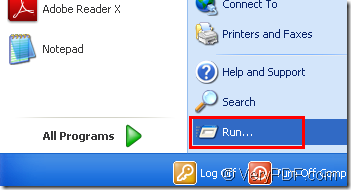 ← How to convert html to tga format? PostScript,always said as PS, is a page description language developed by the Adobe corporation.The purpose of the development of Postscript is to specify how a printer should render a page of text or graphics. It is a stack-based, postfix programming language that performs calculations and draws images.PostScript files can be printed on a variety of printers or viewed on a variety of machines, always optimally using the resolution available. As a graphic language, PostScript is basically vector-based rather than bit-mapped. Thus, it's good at drawing a square or a star, or even a filled polygonal region. But it's rather unnatural, in PostScript, to define a rectangular region in which every pixel has an assigned color. If a highly detailed bit-map image is needed, it is often computed in another format, such as GIF, and then "imported" into the PostScript file. 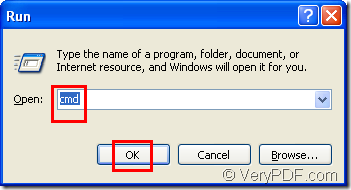 If you want to convert html to postscript, you can use the software HTML Converter Command Line which can be downloaded at http://www.verypdf.com/htmltools/htmltools.zip .HTML Converter Command Line is a zip file when just been loaded to your computer.You should unzip and register it,then the functions can be used without any problems. There are some steps to convert html to postscript by HTML Converter Command Line,you can follow them. 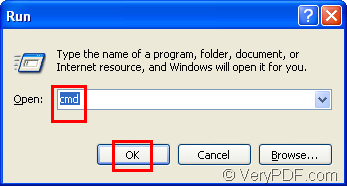 If you want to use command line application,you should run cmd.exe to input dos commands.Please click “start”,then click “run” in the menu.There will pop up a dialog box and you just need to input “cmd” in “open” edit box then click “OK” button.Please look at figure1 and figure2. You should writer the commands in the cmd.exe dialog box.The commands include called program,source file and target file.Please look at fiugre3. "C:\Documents and Settings\admin\Local Settings\Temp\htmltools\htmltools.exe" stands for the path of called htmltools.exe. “www.verypdf.com” stands for the URL of the webpage you want to convert from html to postscript. verypdf.ps stands for the target file and you should name the file yourself.Don’t forget the extension name here which should be written as .ps,not .postscript. The target file will be saved in C disk by default because you run the whole conversion under C dist root directory.Please look at figure4. How to convert HTML to postscrip? How to print html to postscript file? Which product is a good choice to convert HTML file to PDF file? htmltools.exe or docPrint Pro software? How to have a silent switch when using HTML Converter Command Line 2.6? How to set the page height while converting htm to pdf? This entry was posted in HTML Converter (htmltools) and tagged html to postscript. Bookmark the permalink.